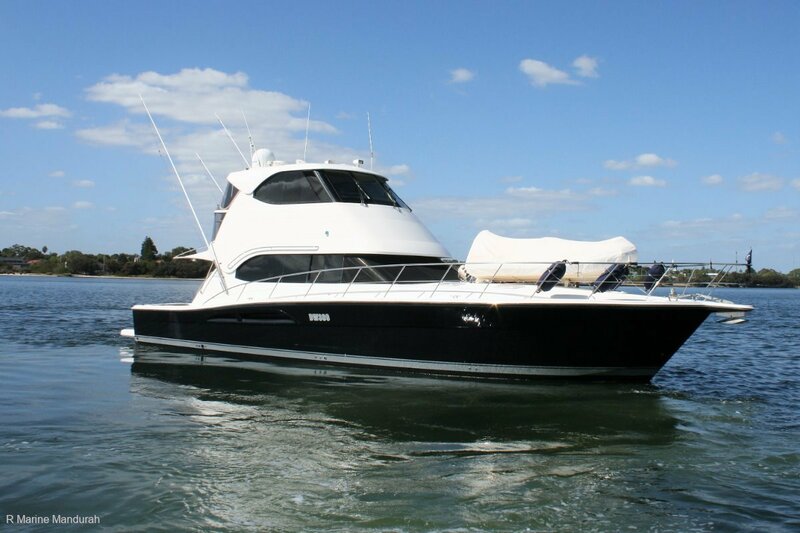 Yet another of the highly sought after boats in WA, the Riviera 51 Enclosed Fly Bridge. As some say these are not an intimidating boat to handle I cant disagree and when teamed up with the Enclosed Fly Bridge and both Bow and Stern thrusters there is nothing you and your family cannot achieve anywhere along the WA coastline. Plenty of Teak as you step aboard both on the swim platform and cockpit is what we have come to expect from Riviera in the 51 range, ample storage throughout lockers in the coamings along with BBQ points, deck showers, a live bait tank to keep the crays fresh and plenty of shade overhead thanks to the 3/4 rear awning. This is the fishermans dream but just as happy cruising the Swan with the family watching the world glide by. Definitely the preferred finish once you step through the saloon door, bright, light and glossy with light coloured leather finishes, roman blinds to all windows and a cherry high gloss finish to all timber work. This is the most preferred internal finish and makes the boat look a more modern finish than the darker interiors. Great features on offer here as well, Saloon leather lounge to double berth, sliding saloon windows, oversized U-line icemaker with additional fridge space, Saloon floor covers to protect the carpets, Foxtell ready, Xantrex inverter fitted and the highly prized internal staircase to the Fly bridge to name a few. Cooking an evening meal a seasoned chef would be proud of is always on the cards with an open plan galley to port complete with quality appliances, Fisher & Paykal twin element stove, SMEG convection microwave, Fisher & Paykal dishwasher and a separate oversized NovaCool fridge / freezer installation. All this over an Amtico galley flooring for that special touch and just an arms length away from the dinning table. If that doesnt bring a smile to your face then perhaps you would prefer the BBQ mounted to the cockpit gunwale, my preference. Accommodation is always outstanding on a Riviera of this calibre offering two large island berth cabins, the master with a private ensuite, the forward with an ensuite doubling as a day head. A pair of bunks for the overflow and should you need it the saloon lounge to a double berth. Sleeping for at least 8 pax will pose no issues. Heading to the Monties fishing with all the crew a simple affair ! Now I like a Fly bridge boat and there is nothing I like more than an Enclosed Fly Bridge. It extends all aspects of the boating available to me in WA. A stiff seabreeze heading back from Rotto is no issue, a long haul up North with hours on the wheel a great experience, adding another dimension to your boating on a cool winters afternoon upstairs a welcome addition. Teak flooring, leather lounges, Wet bar, TV, a host of great electronics and an aft station for berthing or chasing a Marlin down a bonus. Game On has it all. Powered by a pair of Detroit MTU Series 60 shaft driven diesel engines we all know this will perform admirably and economically on those long trip North. Showing just 1000 hours on the MTU engine management gauges there is a lifetime of boating in here yet. Teamed with Digital controls, Twin disc gear boxes and Dual Racor filters this is long haul weapon if the family is interested in seeing what she can truely do. Its all done, just hop in and go ! Call the Team TODAY to arrange a suitable time to view this Riviera 51 Enclosed Fly Bridge. Plenty of room for family and friends to enjoy a few days aboard with a triple cabin layout. Game on is attractively priced in the WA market and a Riviera model that gains alot of interest.